Here’s your chance to convert light into electricity using simple operational circuits. You can apply a similar approach to develop instruments that measure other physical variables in the environment, such as temperature and pressure. You use an input transducer to turn a physical variable into an electrical variable. A photoresistor is an input transducer that converts light energy into a change in resistance, resulting in a change in the current flowing in the circuit. The light is, in fact, an electrical signal. Suppose you’re dealing with a photoresistor that has a resistance value between 20 MW in total darkness and 20 kW in bright light. If the photoresistor is a linear device, then doubling the amount of light doubles the amount of voltage. You can therefore model a photoresistor as a variable resistor that changes resistance according to the amount of light. 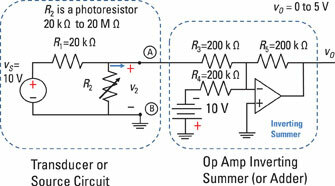 The following figure shows a photoresistor and a complete design of an operational-amplifier (op-amp) circuit to produce an output voltage vO. Determine the output voltage v2 from the transducer. Determine the lower bound of v2. Determine the upper bound of v2. The voltage of v2 ranges from 5 to 10 volts. Simplify the transducer (the source circuit) using the Thévenin technique. The Thévenin technique reduces a source circuit to one single resistor RT and one single voltage source vT. By using the Thévenin equivalent to simplify the transducer, you get a Thévenin voltage vT that varies from 5 to 10 volts and a Thévenin resistance RT that varies from 10 kW to 20 kW. 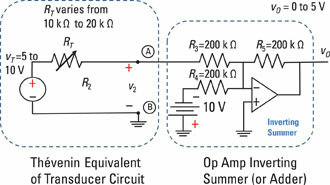 Analyze the op-amp circuit (inverting summer). Because the voltage range of v2 varies between 5 and 10 volts, the output voltage range of the inverting summer goes from 0 to 5 volts.